For nearly a decade, the Arctic Inspiration Prize has awarded millions to Northern organizations and groups to help support and expand their work in Canada's North — and the prize donors say it's poised to continue "basically forever." In February, five projects won $2.6 million at the ceremony in Whitehorse, the first time the prizes were given out in the North. This year's winners ranged from a preschool in Pond Inlet, Nunavut, an art program in Cambridge Bay, Nunavut, that teaches workshop skills to young men, and a local farm training program in Yukon. CBC North is a sponsor of the Arctic Inspiration Prize. Juanita Taylor, host of CBC's Northbeat, was the emcee at the February ceremony. None of that would be possible without the generosity of Arnold Witzig and Sima Sharifi. 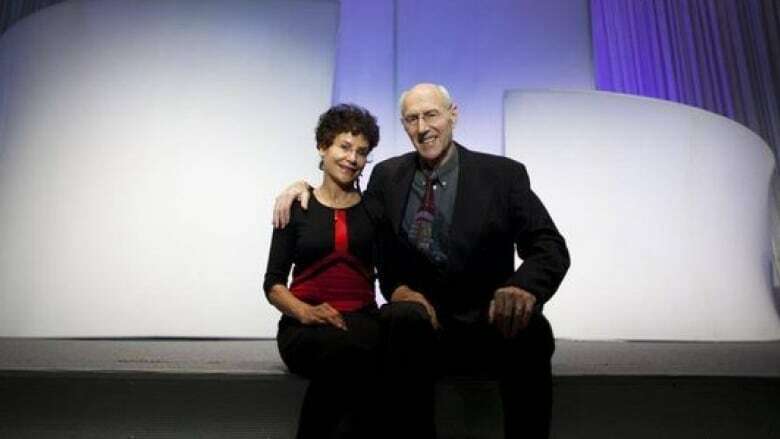 They are the Vancouver couple who started the prize in 2012 and have since donated more than $60 million to the charitable trust that funds the Arctic Inspiration Prize. "It's something very unique," Sharifi told Loren McGinnis, the host of CBC's Trailbreaker. "It's not a handout, it's a celebration of Northerners' ideas, creativities, ways of doing things, ways of dealing with challenges. "The whole prize is in their hands." Sharifi and Witzig are immigrants who call Canada their homeland of choice. They both have an abiding love of the North and say they want to use their wealth to help the people who live there — particularly Indigenous people. For them, the prize is the best way of doing that. "The prize, from the very beginning, was that it has to be 'by the North, for the North' with unconditional support from the South," Witzig said. For Witzig, that means the prize not only has to go to a northern organization, but it has to be decided and awarded by people living in the North. "They know what is needed and what is going on in their communities," he said. "They know the good projects, they know the people who do them and the way that it works for the North." The prize stays true to that commitment through a series of northern ambassadors who live in the North, regional committees for Yukon, the Northwest Territories and Nunavut and a national trust board made up of a majority of northerners, he said. "It's completely by the North," he said. "That's really important to me, and it's why we shouldn't talk about us anymore. We are history." After seven years, Sharifi and Witzig point to the 2014 $1 million award that went to Yellowknife's FOXY (Fostering Open eXpression among Youth) as a highlight for them. Sharifi added her enthusiasm about this year's From Scrap to Artwork project from Cambridge Bay. "[It] totally blew my mind," she said. Looking ahead, the prize is in good hands, Witzig said. The charitable trust is in a stable financial footing and can last "basically forever." For many, that will be music to their ears. It means great ideas from the North to improve the North will continue to find support from the Arctic Inspiration Prize long into the future.